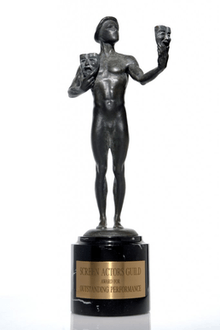 The inaugural SAG Awards aired live on February 25, 1995 from Universal Studios' Stage 12. The second SAG awards aired live from the Santa Monica Civic Auditorium, while subsequent awards have been held at the Shrine Exposition Center. ↑ "History of the SAG AwardsTM". Archived from the original on September 6, 2008. Retrieved 2009-01-27.